Safety Cone to the Rescue! | Create! Safety Cone to the Rescue! 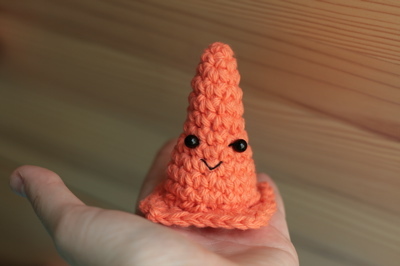 I was originally inspired to make a crochet safety cone because of a pin version I bought from Nut and Bee. First off, if you don’t know Nut and Bee, check out their site. Someone near and dear to me took to the pin, placed it on a messenger bag with the idea that it would protect from everything bad out there. (Would have preferred an infinite number of them!) A soft, more 3-D version seemed in order! 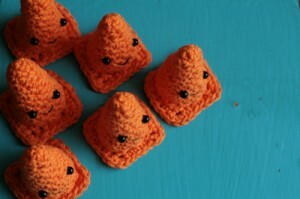 One of the first times I sold the safety cones on Etsy, it was a lot of 6 that was requested. (Buy them here!) The reason? She was buying them for a friend’s cubicle. 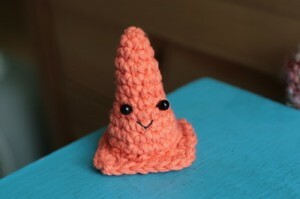 A week or so after I sent them out, the friend contacted me with a very positive response and the subject line “Safety Cones Everywhere!” She writes: “I work in construction management and I have done lots of envrionmental work, so safety cones hold a very special place in my heart (i.e. I don’t get hit by cars, and you always feel safer when they are around). Looking forward to brightening up my office with the cute little cones!” Um, that’s adorable! And the thought of the six of them in an office fills me with glee. Yes, glee. More pics here. A week or so later, someone else bought cones! 5 of them this time around, and for multiple friends. This woman is moving away and wants them to “stay safe” after she does so. How cute! 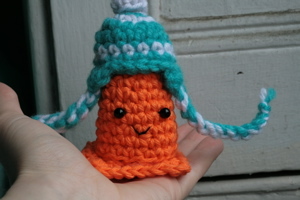 I love the stories that often accompany Etsy purchases. It really brings a personal aspect to virtual shopping. Want the pattern? Click below! Repeat from * 5 more times. Ch 1 and sc down sides, making 3sc in each corner. Ch 2 and make 3sc. Join, snip, leaving a 10-inch tail. Check out the “Snow-Proof” version in my Etsy shop! This will be a fantastic web site, might you be involved in doing an interview about just how you developed it? If so e-mail me! That is very attention-grabbing, You’re a very skilled blogger. I have joined your feed and look ahead to looking for more of your great post. Also, I’ve shared your website in my social networks! Howdy would you mind letting me know which hosting company you’re using? I’ve loaded your blog in 3 different web browsers and I must say this blog loads a lot faster then most. Can you recommend a good hosting provider at a fair price? Thank you, I appreciate it! I¡¦ve been exploring for a bit for any high-quality articles or blog posts in this kind of area . Exploring in Yahoo I at last stumbled upon this website. Reading this info So i am happy to express that I have an incredibly excellent uncanny feeling I came upon just what I needed. I such a lot without a doubt will make certain to don¡¦t forget this site and provides it a glance on a relentless basis. I actually wanted to write a quick message in order to thank you for some of the stunning concepts you are giving out here. My time-consuming internet look up has at the end of the day been honored with good quality strategies to go over with my classmates and friends. I ‘d believe that we website visitors actually are unequivocally lucky to dwell in a fantastic place with very many brilliant professionals with very beneficial suggestions. I feel very much fortunate to have come across the web page and look forward to so many more awesome times reading here. Thanks again for everything.